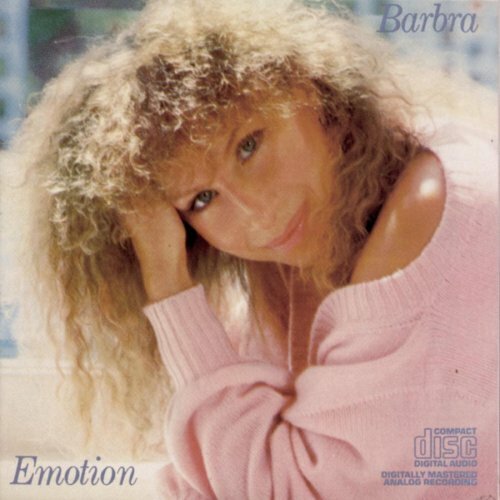 Emotion is the twenty-third studio album released by Barbra Streisand. It was released on October 9, 1984 and went platinum in the United States on December 18 the same year. This album was recorded in eleven L.A. and two N.Y. studios with a multitude of producers and writers. The title track, the third single released from the album, is an upbeat number with The Pointer Sisters on background vocals. This song was also released as a 12″ single, remixed by Jellybean Benitez, popular for his work with Madonna. “Make No Mistake, He’s Mine”, the second single released from the album, is a duet with Kim Carnes with lush cello and piano sounds. Produced by Jim Steinman, “Left in the Dark”, the first single released from the album, clocks in at over seven minutes and features Roy Bittan on piano and Max Weinberg on drums. Another ballad is “Heart Don’t Change My Mind,” written by Diane Warren. “You’re a Step in the Right Direction”, with lyrics by Streisand and music by John Mellencamp, is a fast, rocking tune. The album concludes with “Here We Are at Last”, originally written for the 1987 American drama film Nuts. The album was promoted by a music video of the title track “Emotion”, starring Streisand, The Who’s Roger Daltrey and Mikhail Baryshnikov. The album peaked at number 19 on the US chart and has been certified Platinum by the RIAA. Published By – Editions Sunset Publishing, Inc. Published By – Riva Music, Inc. Published By – Walbeck Music Corp.